A first class package and an audio/visual treat to behold. 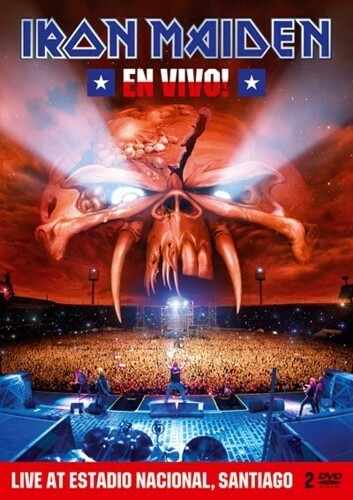 Another Iron Maiden world tour results in, you’ve guessed it, another live concert DVD. The only world tour supporting a studio album since the ‘classic’ line up reformed back in 1999 not to have received this treatment is the critically acclaimed ‘A Matter Of Life And Death’. Maybe it was the less than enthusiastic response from critics and punters alike to them playing the whole album in its entirety that put paid to that! Anyway back to the present. Quite simply ‘En Vivo!’ (Spanish for Live! ), recorded in front of 50,000 rabid Maiden fans in Santiago, Chile is without doubt the best concert video the band has so far committed to celluloid. Shot using a staggering 22 HD cameras it is visually stunning and captures the true essence of a band that are still very much at the top of their game. The DVD also make good use of split screen visuals to make sure that you miss none of the action and you just can’t help getting caught up in the electric atmosphere created by the band and audience alike. Oh and the arrival of ‘Big Eddie’ is pretty spectacular as well! To add to that Kevin Shirley has excelled himself once again with a superb audio production that sounds grittier than previous live recordings. He manages to separate all three guitars in the mix giving you a real appreciation of what Dave Murray, Adrian Smith and Janick Gers bring to the live sound of Maiden. This really drove home to me what an outstanding lead and rhythm player Smith is. Don’t get me wrong Murray and Gers are great players but are too alike tending to contribute the classic Maiden melody lines but Smith is the yin to their yang adding a bit more Les Paul crunch to the overall guitar sound. A lot is made of how Maiden missed Dickinson – who by the way is phenomenal throughout on ‘En Vivo!’ – during their difficult 90’s period but I’d argue that they missed Smith’s playing and song writing abilities just as much. You always get a host of extras with any Iron Maiden DVD and ‘En Vivo!’ doesn’t disappoint. These include a compelling feature length documentary entitled ‘Behind The Beast’. In many ways this is a sequel to ‘Flight 666’in that it documents the second round the world treck in Ed Force One. This time though it focuses on the planning and logistics of making a massive tour like this happen and the huge amount of work the crew put into putting on the best show possible night after night. In other words it’s a must for any of you budding roadies out there. I’ve chosen not to mention the track listing as this was covered by my colleague Neil Daniels in his CD review. But if you’re looking to choose between the CD and DVD I’d go for this. It really is a first class package and an audio/visual treat to behold.